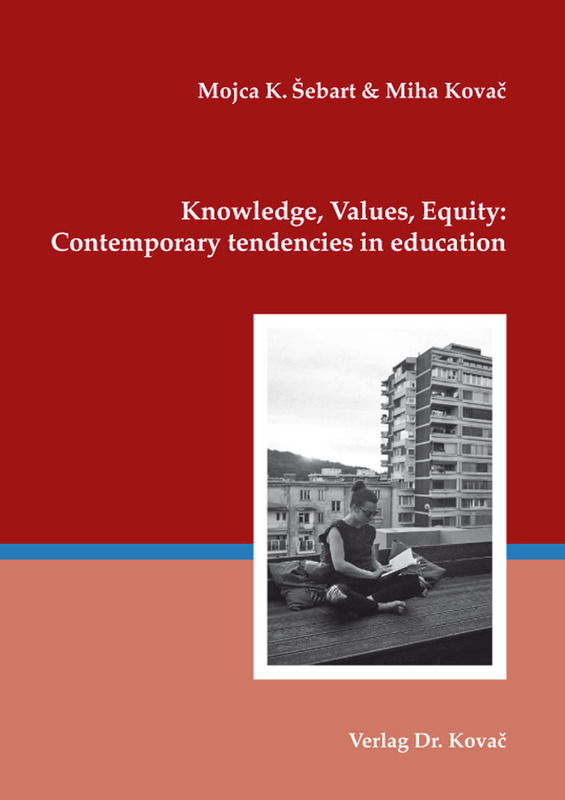 Knowledge, values, equity: Contemporary tendencies in education. Forschungsarbeit von Mojca K. Šebart / Miha Kovač, Verlag Dr. Kovač 2018, 174 S.
This book addresses three main topics: the first one relates to the issue of values in education; the second one regards the role and importance of knowledge in education; and the third one examines the attitudes towards deep reading as this is one of the fundamental processes on which the achievement of any long-term educational goal depends. In regard to the issue of values, the authors claim that society needs to achieve a consensus about what principles can be adopted as common from specific value systems, as this is a precondition for establishing a fundamental system of values on which instruction and teaching in public schools should be based. Such a claim inevitably raises the question of how exactly this kind of consensus can be reached and consequently, how the common value ground of all particular value systems can be identified. For the authors, the answer to this question is obvious: the concept of human rights. Since human rights are considered as the common social value framework, they should also be the normative basis for moral education in public schools, established as a firm and unequivocal point of certainty in educational practices. Furthermore, the authors claim that knowledge needs to be understood as a fundamental formative agent. Instead of treating knowledge only as a mental capacity that helps navigate and respond to our immediate environment, the role of “useless” knowledge in education should be reassessed. Such knowledge is not directly connected with the current needs and interests of learners, but instead enables them to develop depth and breadth of vocabulary and the ability of abstract thinking, while providing them with an insight into the mechanisms that run contemporary societies. On this basis, the book highlights the connectedness between changes in education, the growing role of digital learning tools, and the diminishing role of long form reading in contemporary societies and shows how market mechanisms determine the production of learning tools. The book follows in the tradition of education research as represented by Marcel Gauchet in France and Frank Furedi in Britain. Its main focus are countries in Southeast and Eastern Europe, where the trends discussed by Furedi and Gauchet emerged in a modified form and, in some parts, with a short delay.